Somehow I end up repeating color schemes frequently... and I don't even notice that I'm doing it till later.... Oh well, here's another black and white, and purple and blue scheme... :) I found this spot to take photos today because I was drawn into the scent - whatever flowers these are, they smell beautiful! Bees were buzzing all around me as I took these, though. This has nothing to do with your outfit... but can I say how much I love your hair? I've always wished I could pull off a pixie cut like that. You're just, so dainty and cute! thanks for your lovely comment on my blog dear! i love your dress so much, you look absolutely gorgeous! that dress is so cute! good find! and that song is lovely, i love the whole "dark was the night" compilation. This is a great outfit! I like the cute dress!!! Pretty girl! I love your shoes. I think I have the same cardigan! Except, I painted my room in mine and not it's all spotty, hahah. 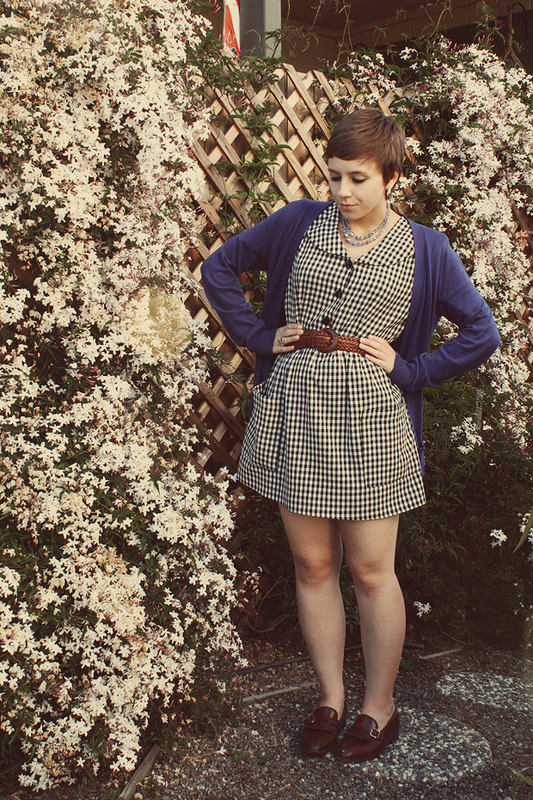 Cute gingham dress. I especially like the collar! your blog is great!! i am following!! delightful , i wish i knew how to shop at forever 21 , i can never find anything there!! I didnt really notice that you were repeating color patterns but whatever, its a great color combo so keep rocking it. Shara Worden's voice is amazing. Have you listened to the song Lua off of this album, love it. I love this outfit!! 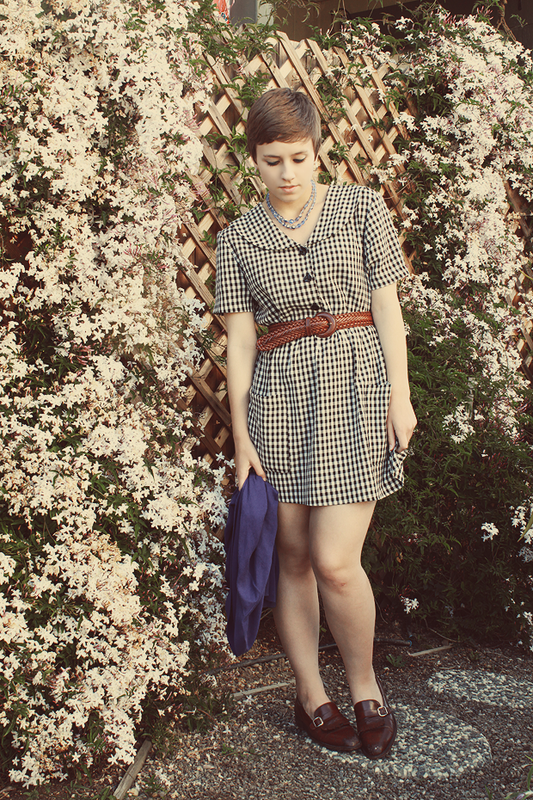 So perfect for the spring...and I love that it is almost all from goodwill! Way to go, girl!! waoh u are so beautiful nice style anyway ! You got that dress at Goodwill? What an amazing find! Plus, I love your pixie cut. I'm not brave enough to get one myself! You are always dressed to the nines!! I love this outfit!! And that dress is the cutest! I think this color scheme fits you well. 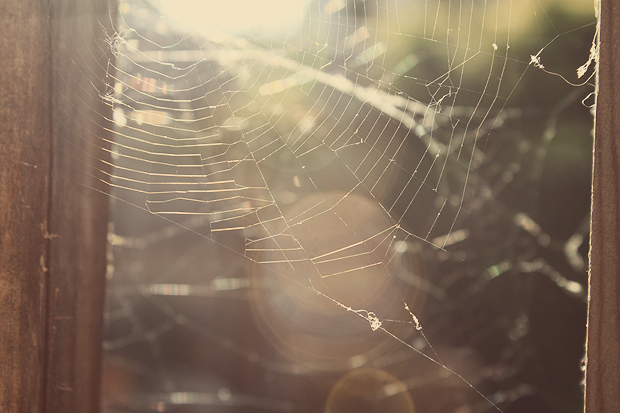 very cute oufit:) I ESPECIALLY love the spiderweb photo. so pretty! I like your style, its really vintage feeling. Ah, i like this dress so much! Lately i've been diggin' black and white dresses. I want to borrow it! hahah. Pretty! Love the collar on your dress :) Sort of sailor, sort of peter pan. Two such lovely things to combine. I end up repeating color schemes too. At least you're more interesting--I usually end up sticking to neutral palettes. Great dress :) Lusting your blog!! Following you! 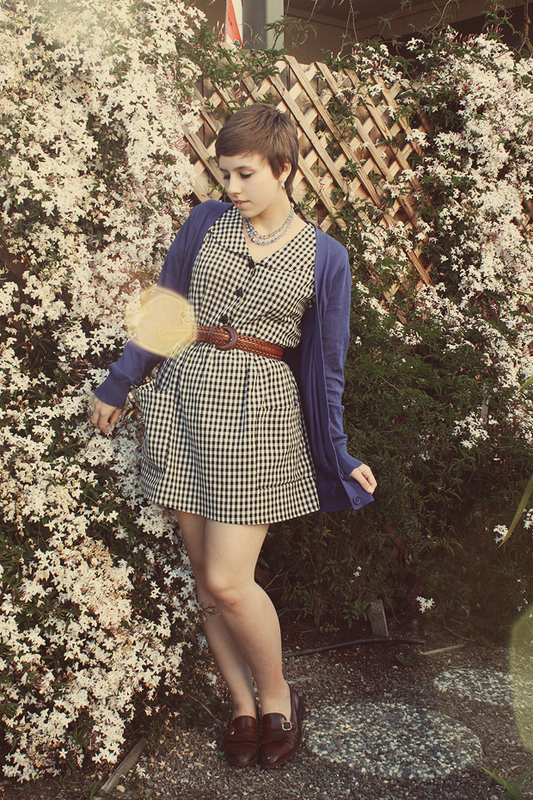 This is such a lovely way to wear the peter pan collared dress - I think the colour scheming does work perfectly here. Great dress, love the blog! Haha, I repeat color schemes a lot too, and don't notice until later. Perhaps it means you have a good thing going! I really like this outfit on you, it's so cute! I feel a bit weird popping up suddenly as I don't think I've commented before, but I wanted to pass on the One Lovely Blog award to you. I've been reading your blog for a little while, and it is lovely. So... yes. i love your dress! and even if its the same color scheme its always so fresh and amazing! Alright. I've SERIOUSLY been considering chopping off all my hair and I thought I settled on leaving it long for now but you have once again reinspired me to rethink it... gah! Your hair is just so adorable on you! Did you have longer hair & just went for it one day, or have you always had short hair? Also love your dress, I had one similar a few months back but sold it on my shop & deeply regret it! Suuuch an adorable haircut. Love your style. Love your look! Very cute - your hair is gorgeous too! Oh this is great! I'll have to try belting my gingham dress with a brown belt. Thanks for the inspiration. That's such a pretty color scheme! <3 And your belt is great! Your photos are looking fabulous! What a great dress, too, and impeccably styled. I've really missed seeing your looks while I've been crazy busy these past few weeks. You're such an inspiration! Thanks for stopping by my blog! It appears that you are also from the Bay Area?? How cool! Maybe one day we can do a blogger meet up :) Love these photos. You are adorable! And this cover is one of my favoriteeees. I play it often! Lovely dress and the shoes are cute! I really love your dress and shoes !